TintCenter Window Tinting > Window Film Blog > Products > Solar > Window Film or Low-e Glass? Energy is becoming an expense consideration, whether it is a residence or a commercial building. The US Department of Energy estimates that inefficient windows result in as much as 35% of the buildings energy being wasted. The California Energy Commission moves that even further by noting that up to 40% of the air conditioning needed to cool down a building result from solar heat gain through the windows. Those costs can make any homeowner or building manager think of ways to be more energy efficient. Those who favor low – E glass windows believe this way because it means replacing the entire window, which may be energy inefficient to begin with. 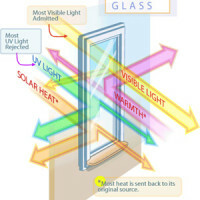 A consumer would have to consider the U – factor, the windows overall insulating value; and the solar heat gain coefficient, which measures the ability of window to deflect solar heat. Because the low – E window products have argon gas between the panels, there is a greater thermal effectiveness as compared to older windows. This product also has the ability to block health threatening ultraviolet rays from the sun. The low – E windows are not inexpensive, however, and could cost as much as $1000 depending on the size of the window being purchased. Window film has been proven time and again to be an inexpensive and effective means of energy savings. It has been proven effective in blocking of harmful ultraviolet rays and the ceramic variety is a successful deterrent to smash and grab robberies. Critics will however go back to difficulties with the window itself. Window film cannot address the problem of an inefficient frame because it only covers the glass. A low – E window installation means the frame will probably be replaced as well and can create better insulation. Additionally, window film blocks solar heat in the winter, when heat is needed. Alternatively, those who are in favor window film will point to the cost differences between window film and low – E window replacement. A homeowner may find it very difficult to afford putting in low – E windows throughout the house. That isn’t quite the problem with window film because the cost per square foot is approximately 1/10 that of low – E glass panes. There are tax incentives available, but these may not make much of a dent in the cost of putting in the low – E Windows. Those in favor of window film will point out the cost and also that the payback period for initial investment is much shorter window film. It boils down to cost. Those who can afford low – E windows will probably move ahead on this knowing that the glass ordinarily can last up to 30 years and window film does not ordinarily last that long. Those who are on tight budgets would probably consider the window film is a better alternative. Either way, it has to be remembered that both will keep energy costs under control and that is the primary reason for making improvements to structure’s windows anyway. In the present time, every people want to make their home more secure. So keeping this point in my mind in going to add a company profile link https://www.youtube.com/watch?v=u5o51rugDOI that is offering window film installation service at the best price. by using this service you can feel more secure. Thanks for sharing the difference between window film and low e glass. The information is really useful. Visit http://supersoundsecurity.com/window-tinting/ for best tinting services. I prefer window films as they are a good heat insulators and add privacy to workplace. Window films are great in reducing glare and preventing UV rays. This would be the cost-effective approach as solar window tints are the good a/c hack for summer. I acquired window films from a reputable company and really satisfied. This blog brings up some great points on Low E Glass vs Window Film that should all be taken into consideration. Awesome information! Thanks for your time to put this all together, we live in the desert, window tint is a must!